MOST of them are too young to attend the inaugural Byron Bay Falls Festival, but a group of students from Mullumbimby High have been working on the site for the past week as part of a mentorship program to give them some experience in festival construction. From building a bamboo structure for the Guerrilla Stage – a performance space specifically for local acts – to building timber furniture, putting up fencing and putting down floors, the crew has been involved in all aspects of setting up the site. Four of the six participants are under 18 so won’t be able to attend the festival when it is in full swing from December 31 to January 3. Jara Larter, who is 18 and will be attending, has also worked with the Blues Festival and completed an event management course at TAFE. He said the Falls’ mentorship program was “a lot more on the physical side” compared to his office-bound experience at Blues Fest, but they had all enjoyed it. 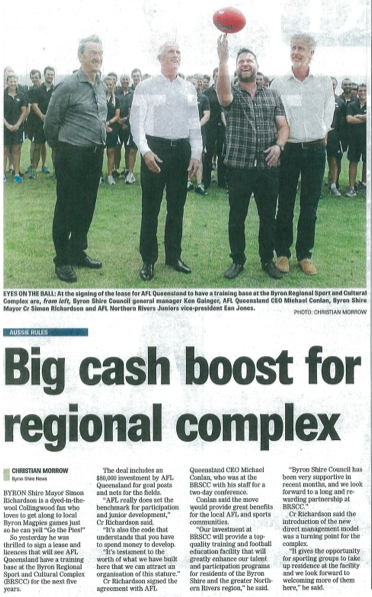 Byron Shire Mayor Simon Richardson said with the number of festivals taking place across the Northern Rivers, there was an opportunity to design a curriculum with hands-on experience that would give participants a recognised qualification. Having Falls Festival at the Yelgun site had not only given hundreds of local artists and performers work, but also created a space where 3000 local adults would go and party on New Year’s Eve, he said. Cr Richardson said there was “a real split in the community” after last New Year’s Eve, with some people calling for no festivities at all. Falls Festival organisers moved their date to incorporate New Year’s Eve and also donated $25,000 that would go towards Byron’s “Soul Street” family-friendly festivities in town. “We have been able to respond, rather than wish the problem away,” Cr Richardson said. 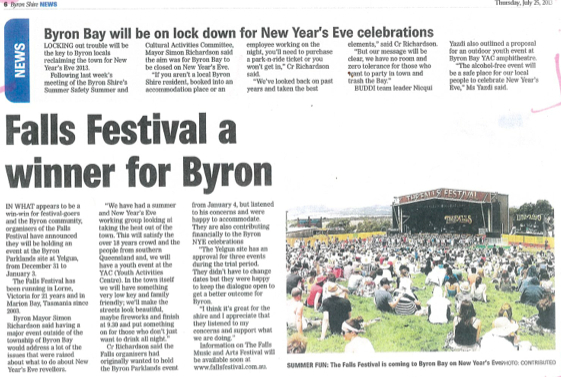 RIOT police, alcohol prohibition, special event parking limits for non-residents and family entertainment will keep New Year’s Eve celebrations at Byron Bay under control, says Byron Shire mayor Simon Richardson. “Last year we dodged a bullet – we didn’t have a riot… but we did have disrespect to the town and residents didn’t feel safe,” Cr Richardson said yesterday. 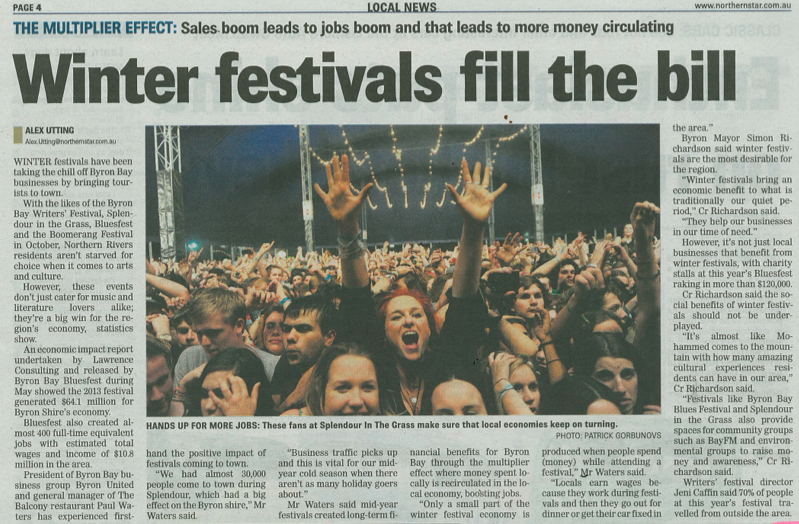 “Normally we get 5000 people into Byron Bay on New Year’s Eve, last year we attracted 20,000,” he said. Cr Richardson this week met with Byron Bay police and confirmed riot police would be deployed to the town this New Year’s Eve. This follows a decision by Roads and Maritime Services to cancel police-run roadblocks into the town. Cr Richardson said the roadblock had been the centrepiece of the Safe Summer in Byron Bay initiative and described the RMS decision as “really disappointing” but said Plan B was in place. “One of the big problems we had last year was not enough alcohol being confiscated,” he said. “The road block would have stopped the “Esky on wheels” situation. 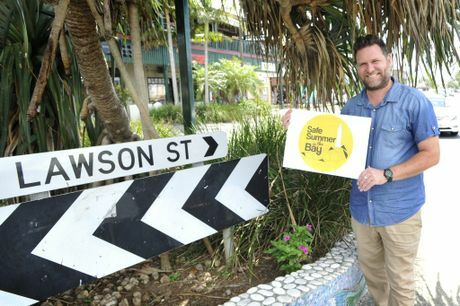 Cr Richardson said in addition to the infrastructure in place for New Year’s Eve and the Falls Festival drawing crowds away, the family-friendly Soul Street entertainment planned for Railway Park would be welcoming for families. “We want the community to feel like they own the streets again,” he said. Inspector Greg Jago confirmed public order police and riot police would be in Byron for New Year’s Eve, along with additional police. “We also have drug detection dogs available to be deployed in Byron Bay on New Year’s Eve if needed,” he said. FIONA Hunter spent last New Year’s Eve in fear. Having locked the gates on her property at Melaleuca Dr, Sunrise Beach, she stayed up all night on guard, watching out for the packs of aggressive party-goers terrorising her street. “It was a nightmare. There were about 30 carloads of them and they had set up camp along our street, drinking,” Ms Hunter said. “They were using our neighbours’ gardens for showers and setting things on fire. We could have had a bushfire because of it and no emergency services would have been able to get through – the campers had closed off access to the road with the way they parked their cars. This New Year’s Eve, Fiona and her neighbours have vowed to take matters into their own hands if forced. “Even if it means breaking the law, we will set up our own blockades so that no cars can enter out street,” she said. 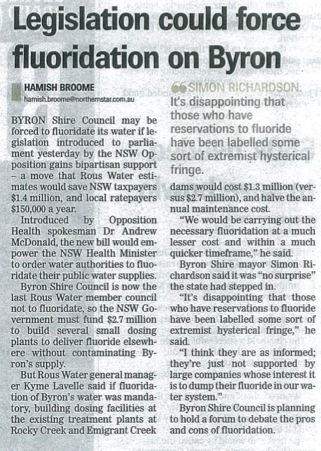 Yesterday, Byron Shire Mayor Simon Richardson said he had asked staff to provide Melaleuca Dr with bollards for NYE. “They got hammered (by illegal campers) last NYE. It was disgraceful,” he said. Two-hour parking restrictions will be in place across the whole town on NYE, from the Belongil entrance point to Red Devils at the southern point. “This has been approved by the Roads and Maritime Minister and sets a precedent in NSW. This hasn’t been done outside of the Olympics,” Cr Richardson said. Residences will be sent two parking permits and anyone else caught parking outside the time limits will face fines of up to $2000. A map from Byron Shire Council showing parking restrictions at Byron Bay between December 26 and January 6. 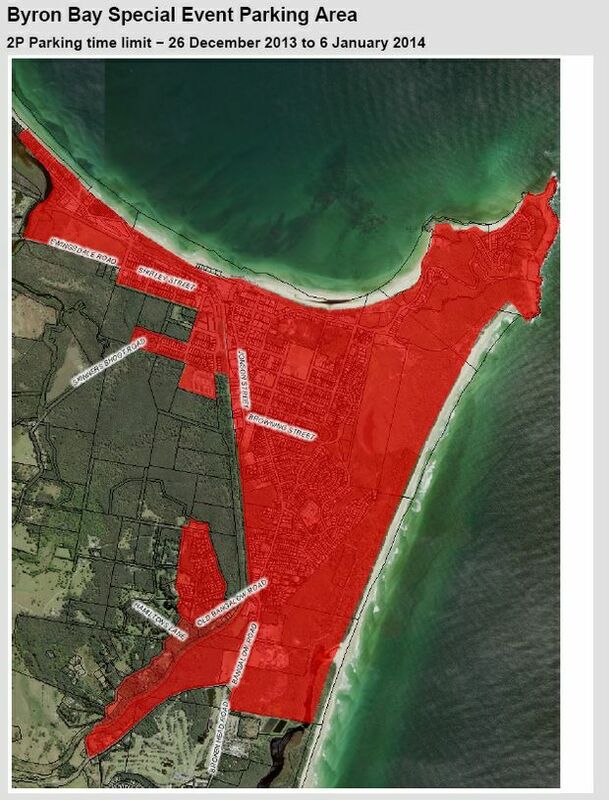 The restrictions limit parking to two hours only and apply to all the areas shaded in red. 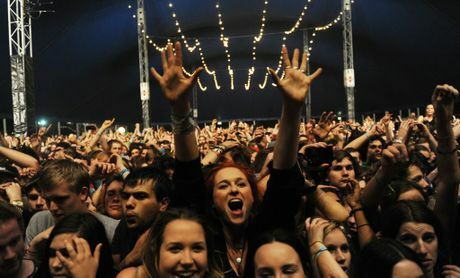 DESPITE the widely reported traffic gridlockcaused by the Splendour in the Grass festival, Byron Shire Mayor Simon Richardson praised the event ahead of a debriefing session with stakeholders. 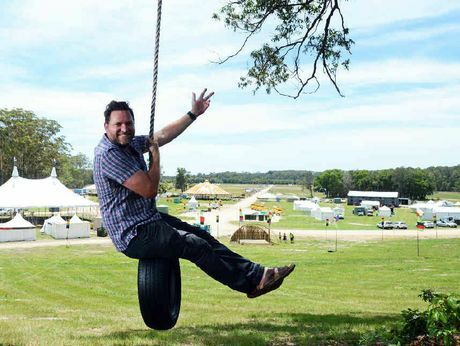 The meeting to discuss the festival’s first year at the North Byron Parklands site at Yelgun will be held within two weeks and involve all the key people he said. “There were certainly teething issues with getting into the festival,” Cr Richardson said. “Brunswick Valley Way had meltdowns on Friday and I waited for an hour and a half at the Yelgun turnoff before then queuing at the gate. “There was inconvenience for patrons with traffic, toilets and queues, but generally speaking, for a trial festival of 25,000 people, I think overall they did a pretty good job. Cr Richardson said he was impressed with the tree-planting work that had been done over several years on the site and was encouraged by the trial of composting toilets. 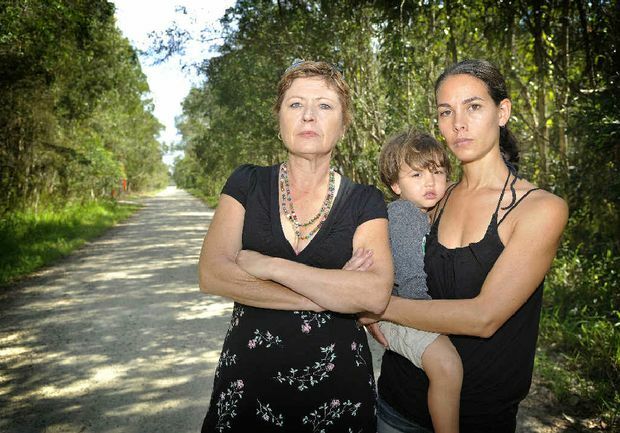 Festival organisers yesterday described the three-day event as “one massive house-arming party at North Byron Parklands” and thanked people for their patience as problems occurred, including issues with bus services which provoked a barrage of complaints on social media. 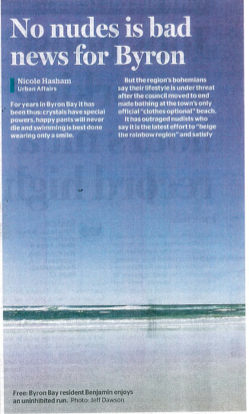 Byron’s naturalist community is fighting to stop council from forcing beach goers to cover up. 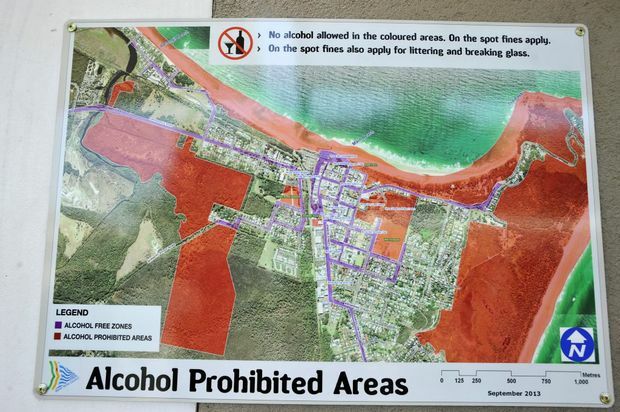 Complaints about anti-social behaviour at the Tyagarah nudist beach has council questioning whether or not to overturn its “optional clothing policy. Nearly seven months have passed since ex tropical cyclone, Oswald wrecked havoc on the Far North Coast beaches, but our coastline is still struggling to recover. Byron Council is working against the clock, trying to remediate the damage before the storm season rolls around again. When people go to the polls on September the seventh there will be one less vote to cast. The calling of an early election means that the referendum to recognise local government in the Australian Constitution will have to be put on hold.